Rosie Huntington-Whiteley travels all over the globe on the regular, so it&apos;s safe to say she&apos;s got the whole packing thing on lock. But, now, her suitcase secrets can inform your Spring Break luggage game. 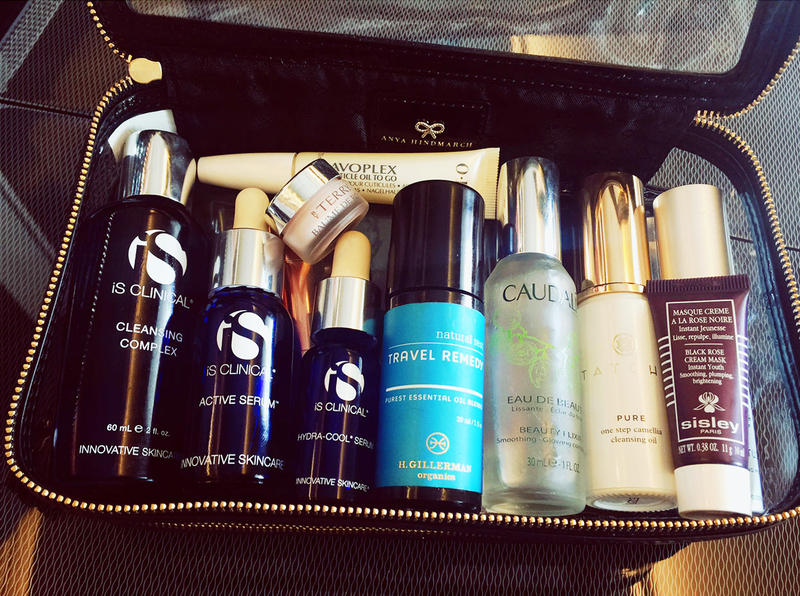 The model, 28, gave a list of her travel essentials to the Violet Files, and it couldn&apos;t be more helpful. Scroll through to see her best tips. 1. When choosing outfits, think about your destination. "In London, I&apos;ll likely need light jackets, a Burberry trench, Gianvito Rossi heels and Chloe sweaters, no matter what time of year," she told Violet Files. 2. Forget about packing light. "I never check less than two bags. I&apos;m the best/worst packer!" she joked. 3. Choose luggage that lasts. "I constantly have to replace my luggage as it gets so battered," Huntington-Whiteley admitted. "The best brand I&apos;ve found is Tumi. I use their Aden Expandable Fortnight Trip — they&apos;re the most durable bags I&apos;ve found." 4. Make a checklist for your must-haves. The Ugg global brand ambassador never leaves home without her "iPhone, passport, reading material [currently Dr. Nigma Talib&apos;s book Younger Skin Stars in the Gut], change of currency and converter plugs." 5. In transit, two ensembles are better than one. Especially for a long, transatlantic flight, Huntington-Whitely recommends having two outfits: a polished, elegant look for departure and arrival, and a cozy set to wear in-flight. "I change straight into comfortable clothes, folding and hanging my airport outfit to avoid any creases before landing," she said of her plane-approved loungewear, which includes a cashmere wrap and lounge pants from her own line, Rosie for Autograph, a soft white tee from Paige Denim and cashmere socks borrowed from her fiancé, Jason Statham. Drink water and moisturize everything while in the dry environment of the aircraft. "First order of business [is to] ask for the biggest bottle of water they can provide and try to drink at least 3-4 liters," she said, adding that her makeup routine follows a similar method. "I remove my makeup with Koh Gen Do wipes as soon as I&apos;m settled and spritz with Santa Maria Novella Acqua di Rose. I follow up with my regular skincare routine: iS Clincal Pro-Heal Serum or C-15 Serum and Dr. Barbara Sturm Face Cream or Chantecaille’s Rose de Mai moisturizer, plus By Terry Baume de Rose for my lips," she explained. "I apply African Botanics Marula Body Oil to my legs and feet to keep them hydrated." "I bring my own food so I can avoid the plane food — usually I&apos;ll pack a pale wrap with turkey or chicken and salad, as well as nuts and dried fruit," she stated. "I never travel without a lint roller in my bag to freshen up my outfit and my Rosie for Autograph fragrance," she noted. What do you think of Rosie&apos;s travel tips?